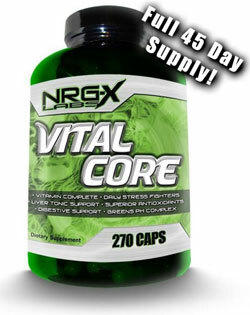 NRG-X Labs Vital Core On Sale! Vital Core Multi Vitamins by NRG-X Labs offers a full 45 day supply of many of the essential vitamins your body needs to maintain an overall healthy immune system and perform daily functions. After all, it's the little things that count, and if you are overlooking your multi, you are hindering your progress in and out of the gym. These easy-to-swallow capsules contain powerful vitamins and minerals. No more choking down, huge "horse pills" or taking handfulls of them. This is not one of those generic "once a day" vitamins. Plus each bottle is a FULL 45 Day Supply - not like some Paks that claim to be a full 44 day supply only to learn that you need to take 2 paks a day to get what they claim on the label. No trickery here - just use Vital Core and you're done! Vital Core combines key vitamins, minerals, greens blends, liver support and free radical scavengers for supporting optimal enzymatic functions, immune system, detoxification, pH balance and digestive health. Vital Core™ is enhanced with daily stress factors to combat the mental and physical fatigue that tear down our mind and body everyday. Vital Core™ strengthens from your CORE. Vanadium (as vanadyl sulfate) 5mg. Boron (as boron chelate) 2mg. Suggested Use: Take 3 VC-Caps™ twice per day with your meals (breakfast and dinner preferably). For best results, Vital Core™ should be used in combination with other NRG-X Labs® high quality products. It is recommended to consume at least 1-2 gallons of water per day, while eating a high protein/moderate carbohydrate diet as part of a healthy nutritional plan.